It was 38 degrees here today and after the cloud of red wine lifted, I went for a run at my favorite park. The park was quiet except for a few dog walkers, and a few deer. I thought about the summer days when the park is busy…the picnic tables like magnets. A mother brings crayons, and sandwiches, both in a ziploc bags. Her daughter ignores the coloring book, drawing a lopsided tree on its top plank. Lovers arrive in separate cars, him in a tie, her in shorts, legs long and tan. An hour, and tears later, they hug. It will be their last. Her dream of forever vanished in the park, under an ash she’ll never forget. A family arrives and stakes its claim. Dad grills hotdogs, charing the skin. After dark, the twins watch fireworks boom overhead, mustard stains on their shirts. The light of the days shrinks…the leaves go orange, then brown, finally falling under gray skies. 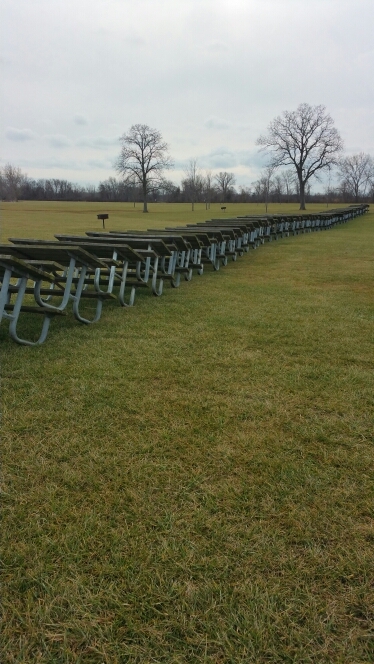 The picnic tables are rounded up, stacked on a bias, defense against the elements of winter. Waiting for the return of the kids, the fireworks, the families and the lovers.